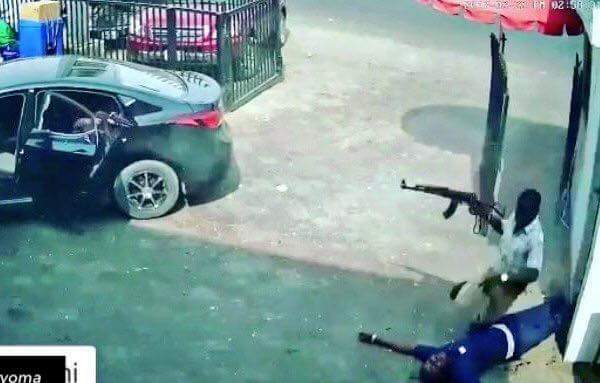 A policeman, who has been described by many Nigerians as a hero after a viral video showed him gunning down one of the four armed robbers who attacked a bank in Imo State in February 2017, died two months after the incident, Saturday PUNCH has learnt. The three-minute video, apparently a CCTV footage from the bank, has been circulated on news sites and blogs in the last few days, quickly becoming one of the most talked about events of the past week in Nigeria. It shows a car entering the bank premises, only to be followed by a black Hyundai Elantra, some seconds later. Four men emerged from the vehicle, with three holding weapons, which looked like AK47 rifles. The video shows the first person out of the vehicle releasing a shot which caused many people at the entrance of the bank, including the uniformed security man, who opened the gate to flee. But the robbers were swiftly engaged in a gun battle. Shots rang out from the security post at the bank’s entrance, shattering the car windows. An occupant of the car shot back. But one of the robbers, who had tried to attack the occupant of the security post, was instantly shot dead. The video shows Iboko who shot him escaping from security post, while one of the other robbers pursued and shot after him. The Imo State Police Command told our correspondent that owing to the multiple gunshot injuries sustained by Iboko, he succumbed to his injuries two months later while in intensive care. Spokesperson for the command, Mr. Andrew Enwerem, explained that two other policemen were in the security post during the shootout and also sustained gunshot injuries. “They were in intensive care for up to two months. The two survived but Iboko died. He was a sergeant and mobile policeman,” Enwerem said. Prodded for more details, Enwerem said he did not have information about the deceased policeman’s age or his hometown. Since the video became viral, there have been calls to reveal the fate of the cop as Nigerians demanded more recognition and honour for the deceased policeman. On Twitter, many said such heroes must be celebrated.